This one qualifies as probably the most egregious omission in the entire list, because it combines two featured categories (Johnny Cash and the Muppets) and yet STILL wasn’t included. Let’s rectify that now. The Man in Black upstaged the Man Named Black by having not one, but TWO guest appearances on Sesame Street. These appearances (in 1973 and 1993) spanned a full two decades, illustrating the longevity of both Cash’s career and the show’s run. In this clip, from Cash’s 1973 appearance, he croons a ballad about Nasty Dan, “the meanest man I ever knew.” Oscar the Grouch (puppeteered and voiced by Caroll Spinney, who also did Big Bird) interjects his own commentary as the story-song progresses, and these reactions are the highlight of the number. You will probably never see Oscar as happy as Johnny Cash and the saga of Nasty Dan make him. “Nasty Dan” was an original composition by songwriter Jeff Moss, who also penned the Sesame Street breakout hit “Rubber Duckie.” Johnny Cash would later re-record the song for his 1975 children’s album. Now, I’m going to wrap up this series and get out of Dodge, just in case our own Nasty Dan comes looking for trouble. 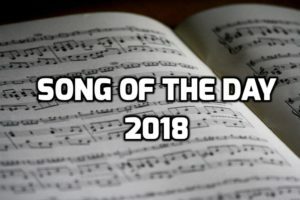 First, I should note that I have demoted the previous “Song of the Day” by Johnny Cash to a “Song-orable Mention” and replaced it with another “Song of the Day” by a different artist.” I’ve articulated clearly the expectation that every song nominated as a “SotD 2018” be by a different artist. I’ve investied considerable effort in optimizing artist-by-artist nominations. But I somehow missed saving Johnny Cash for Brian’s week, despite his affection for The Man in Black. And once I carved out a spot for Johnny Cash, it didn’t take too much reflection for me to pick one song Brian had highlighted: As previously mentioned, I am easily swayed by references, positive or negative, to the editing staff of Earn This (i.e. me). I will endorse any song with “Daniel” (see: Elton), “Danny” (see: Kenny), or “Dan” (see: this) in its title. I fully embrace the deprecating nature of the song. I don’t reject any suggestion that I am “nasty” or “hard to understand.” In fact, I’m all in on the nickname “Nasty Dan.” I hope I’m mean enough to fit the bill. I can start chewing tobacco or vaping or something if it would help.